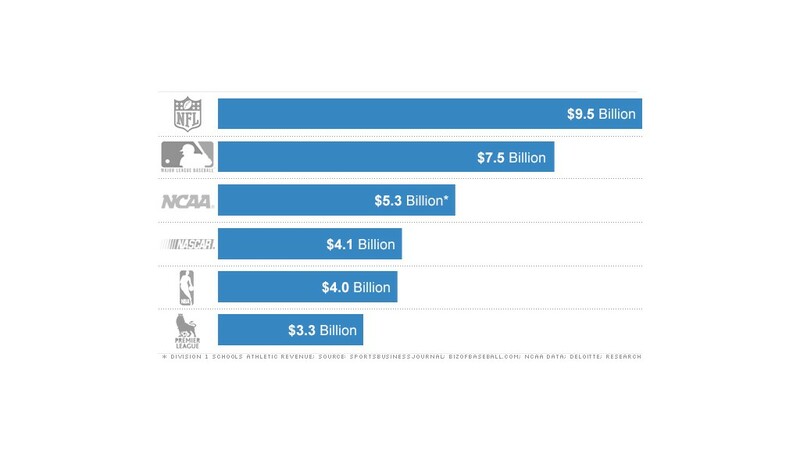 Annual revenue of major sports leagues in the most recent year for which data is available. On the eve of the Super Bowl, the National Football League is playing defense over a rash of concussions to players and dealing with more empty seats in the stands. But it remains by far the most popular and lucrative sport in America, raking in nearly $10 billion in 2012. Football has come under harsh scrutiny regarding the head injuries sustained by its players, as well as a rash of its former stars committing suicide. Indeed, Ravens safety Bernard Pollard, who is playing in the Super Bowl, recently remarked that the plague of head injuries might put the NFL out of business in the next 30 years. President Obama, who is an avid fan of the Chicago Bears, said that if he had a son he'd "have to think long and hard before I let him play football." And while tickets for the Super Bowl sold out for thousands of dollars a pop, there were almost 1 million empty seats at regular season games this season, up more than 50% from only four years ago. But what puts football over the top in terms of profitability are the league's pricey broadcast rights deals. The $4 billion in revenue it pulls in from television deals is roughly equal to the total sales for the National Basketball Association and more than the sales of the English Premier League, the world's most lucrative soccer league. The NFL can command so much because its games are regularly the top-rated shows on various networks. Advertisers are forking over $4 million for spots during the Super Bowl. But even regular season football games draw a large audience that tends to watch the sport live, meaning they aren't fast-forwarding through commercials. That's something marketers are willing for pay a premium for. In a world with more entertainment options than ever before, "sports are worth more today than they ever have been," said Tom Spock, founding partner Scalar Media and a former NFL business executive. He said with audiences so fragmented, "there's a premium that comes with the scale only the NFL provides." TV deals are already in place for the league to receive about $5 billion a year from 2014 to 2021. As dominant as the NFL already is financially, it says it plans to boost annual revenue to $25 billion within 15 years. Eric Grubman, executive vice president of NFL ventures and business operations, said some of that growth will come from existing revenue streams, like tickets, sponsorships and television. But it also expects to see big gains from mobile media and international revenue. "I don't know when it [mobile media] will turn into an enormous revenue stream," he said, "but I know it will." Given its staggering success, it's hard to imagine football's dominance could ever slip away. But Grubman points out that 50 years ago horse racing and boxing were the nation's most popular sports. Now they are afterthoughts. The matter of head injuries is a potential business problem for the NFL, even if it hasn't hurt revenues just yet. Thousands of former players have filed suits against the NFL alleging that it failed to address the sport's neurological risks. The highest profile case came just last week when the family of former star linebacker Junior Seau, who committed suicide last year while suffering from an injury-related brain disease known as chronic traumatic encephalopathy, filed a wrongful death suit against the NFL. Experts say beyond the legal risks, the growing concern about football's brain injuries could hurt the sport's popularity. "They're very dependent on the way they're perceived," said Andrew Zimbalist, a Smith College professor and leading expert on the business of sports. But if more players commit suicide or there are more high profile lawsuits, he said "maybe the perception of football begins to reverse."